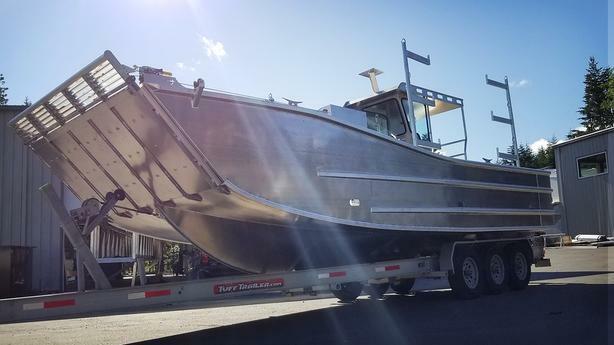 The Islander 300W is a versatile landing barge perfect for the Westcoast waves. The 17deg deadrise provides efficient wave cutting and displacement while the wide chines improve handling and stability. The double hull at the keel offers a sense of security and peace of mind. The 5086 bottom and sides will provide the greatest longevity and durability. In this cabin-less state, you can choose which cabinet or console you want to add in half the normal order time. Weather you are looking for a multi-function island hopper, or a commercial work-horse, the Islander 300W is your best choice. Deadrise 17degree @ transom, minimal progressive "VEE"
Amenities Includes Aluminum Cleats, Stabilizer Anode and Transducer mounting plates, Self bailing deck with 4in scuppers. Please note the bare hull does not include the Electrical system, or paint. The Windlass for the gate is not included in the bare hull price.